Some days... well, most days... 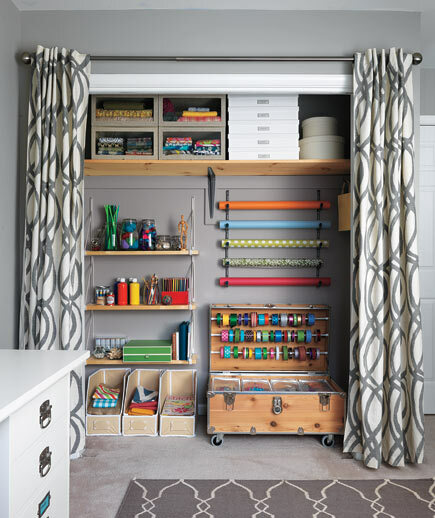 I dream of having a closet that I can fill entirely with crafts and gift wrapping supplies. I think it would look something like this. I seriously love everything about this photo; the rolls of wrapping paper mounted to the wall, a rainbow of ribbon choices inside a trunk (so cool! ), labeled bins on the shelves for projects. 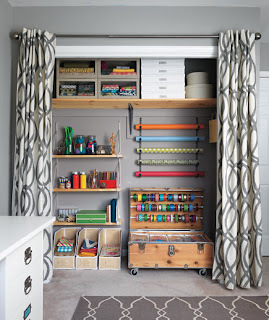 Not to mention the lovely curtains and rug... aaahhh, I WANT IT!! What do you dream about having in your home?